More and more employees spend their working time on facebook and decrease productivity and efficiency and accidentally leak company secret or commercial plans. It's time for employers to block facebook and prevent data leakage on facebook. Should Facebook be blocked in work places? Facebook can be a great connection tool to find old friends and let those close to you keep up with your activities. However, Facebook has also become a problem in business environment. Employers may waste time that should be focused on work, may accidentally cause data leakage and lead to business loss. Sounds like Facebook should be blocked? And if yes, what should be done? * disparage customers or clients of the business. Employers can fire employees for Facebook posts or other social media comments outside of work hours by following basic workplace laws and procedures. Rob Bowes, a security consultant, has uploaded details of about 100 million Facebook users in form of a torrent. This file is a list of Facebook users with their profile link, user name and unique ID. Bowes said that this data was put up in public domain to highlight security issues. In fact, Facebook has already kept this information public – www.facecook.com/directory. In an official statement, Facebook has clarified, “No private data is available or has been compromised. Similar to the white pages of the phone book, this is the information available to enable people to find each other, which is the reason people join Facebook.” From time to time, Facebook has been blamed for weak security and each time, Facebook has come up with a bold reply. Facebook already offers Privacy Settings which can be used to keep your personal information secure. A new report shows that Facebook's targeting systems enable marketers to learn the identity of users who fall into specific categories -- including ones as sensitive as sexual orientation. There are some ways to block Facebook and we introduce two simple ways below. Many PC users use Internet Explorer to browse websites. To block Facebook on Internet Explorer, you can follow the stps below. Open Internet Explorer and click on Tools, Click Internet Options, Click on the Content tab, click the Enable button, click on the Approved Sites tab, Type www.facebook.com in the box, Click Never and then OK, In the appeared window type and confirm your new password, Click on the General tab and make sure to select Users can see websites that have no ratings, click OK. However, there are also many users using Firefox, Safari, Google Chrome, Opera or some other browsers to visit Facebook. Even if you block Facebook in all these browsers, users can easily remove Facebook from the blocked list. Modifying hosts file is another easy way and it's stealthier than the method of browser settings. Paste them into the Hosts file after 127.0.0.1 localhost, save and close the Hosts file. After reboot, the hosts file should take effect to block Facebook. 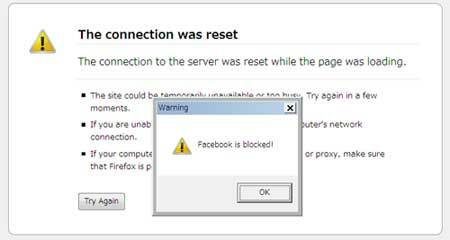 If you have installed anti-virus or firewalls, you can also use them to block Facebook. However, those ways can be easily bypassed or reverted to default if the user is not a computer novice. SurveilStar specialize in employee monitoring which helps employers to improve employee porductivity and prevent data leakage. There are many powerful functions coming with SurveilStar and one of them is to block any website you don't want your employers to visit in working hours. After deploying SurveilStar Agent on client computers, you can specify the users what website they can or can't visit respetively via SurveilStar Console. 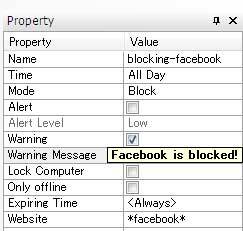 For blocking Facebook, you can create a web policy, specify time range, and enter Facebook's URL and set mode to block. Then the computers where the policy is applied to will not able to connect to Facebook any more. You can also enter wild-card in website address. If you want to block any website whose address contains facebook, you can simply enter *facebook*, then website like http://www.buyrealfacebookfans.com will be also blocked. If you want to block other social networking sites like Myspace, Twitter, you can setup a website class first and then enter all the social networking sites' address, and set web policy to block websites listed in this class. Below is the illustration of Facebook blocking policy and the result when a user tries to visit Facebook. SurveilStar is more than just a website blocking application, it can block anything you want to block. Applicaitons, IM Chats, Emails, File Sharing, Priting, Devices and more can be blocked by SurveilStar with respective policies. If you are interested in SurveilStar, 30-day free trial is available.